Not so Funnies: What can St Lucia learn from New York’s crime crackdown? This cartoon, published in ‘The Funnies’ section of St Lucia’s The Star newspaper on June 2nd, will have created significant disquiet in the island’s corridors of power. It depicts Hermangild Francis, Minister for Home Affairs, Legal Affairs and National Security in St Lucia, surrounded by the dead victims of St Lucia’s violent crime epidemic, promising that the answers to local crime lie in the island’s growing portfolio of crime reports. The cartoon was something of a watershed for St Lucian journalism. 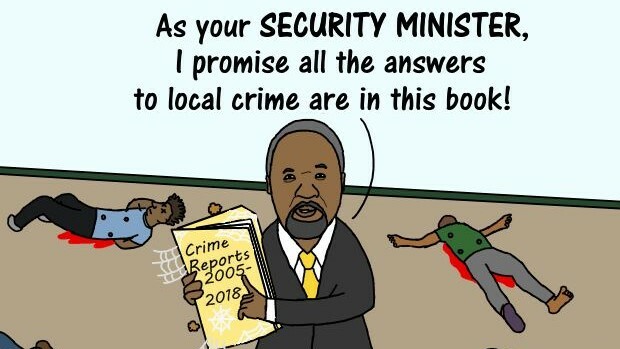 Brave reporters have been demanding answers and solutions to the island’s horrendous murder rates for some time, but this is the first time we’ve seen the problem depicted through humour. Many a true word is said in jest. While many St Lucians have protested valiantly that the island remains a holiday paradise (true), that victims tend to be locals (also true) and that tourists are unaffected (patently not true), we are starting to see these protestations become demands for answers. Rightly so, with 34 murders for every 100,000 residents in 2017 St Lucia has one of the worst homicide rates on the planet. If you are in St Lucia today your chances of being murdered are greater than if you were in Colombia or Guatemala, or even living in New York during its own violent crime epidemic of the 1980s. New York was racked with crime during this period. The city had one of the worst murder rates in the world; open-air drug markets operated in the heart of Manhattan; major bus and railway stations were magnets for beggars, drunks, thieves and drug addicts; and people abandoned the subway fearing New York’s notorious gangs. What followed through the 1990s, however, was a decade of significant progress as crime rates dropped dramatically in New York City. Homicide levels in the City fell from 31 for every 100,000 residents in 1990 to just eight per 100,000 in 2000, a reduction of 74%. While some of this could have been down to changes in economic fortunes and an aging demographic, that can only explain part of the answer. While crime levels fell across American cities, none experienced reductions as steep or as prolonged as in New York. Overall levels of violent crime declined by more than 56% in New York, compared to around 28% nationwide, and reductions in property crime were also much more dramatic in New York than elsewhere over the same period. That New York’s authorities were able to arrest its violent decline, address the crime situation and rebuild its reputation should provide insight and inspiration for those charged with solving St Lucia’s problems today. READ MORE: What caused violent crime rates to fall in New York. What caused crime rates to fall in New York?